Get pre-packaged ingredient combinations from brewers around the world shipped to your home. Are you anxious to taste beers from Cinder Block Brewery in Kansas City, but know that they aren’t available in your state? With the newest iteration of the Pico home-brewing appliance, you can create clones of beers in your own home from your favorite breweries as well as breweries that don’t distribute to where you live. GeekWire called the easy-to-use countertop machine “a 3-D printer for beer,” given that it functions very similar to a Keurig. 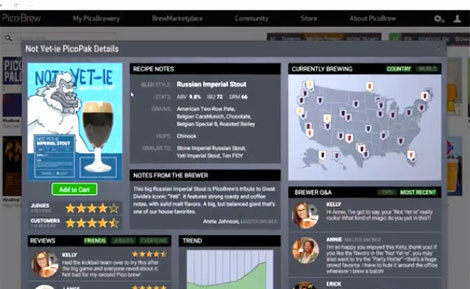 You can actually change a recipe to your taste (e.g., if you think Rogue is too bitter, you can tell the machine to dial down the hops). The company behind Pico will start manufacturing the machine early next year, and we suggest you get your hands on one for $499 by pledging to the Kickstarter. Personally, we can’t wait to brew a different beer every night in the confines of our own home once this revolutionary home-brewing appliance hits the market in Spring 2016.